Objective: We recently reported a novel technique for repairing paraesophageal hiatal hernias greater than 5cm, using primary non-pledgeted crural repair with onlay fixation of GORE™ BIO-A™ Tissue Reinforcement. The purpose of this report is to present one-year follow up data. Methods: Patients were evaluated at routine clinic follow up visits. Patients with recurrent symptoms of GERD underwent further evaluation including upper GI series x-rays followed by endoscopy or more detailed imaging if warranted. Results: Of the seventeen patients included in the original series, one-year data was available on sixteen. Four were male, twelve female. The average age was 58 years, with a range from 38 to 85. The average length of follow up was 13 months, with a range from 10.9 to 15.7. There were no complications related to the mesh itself, including infection, erosion into adjacent structures or fistula formation. 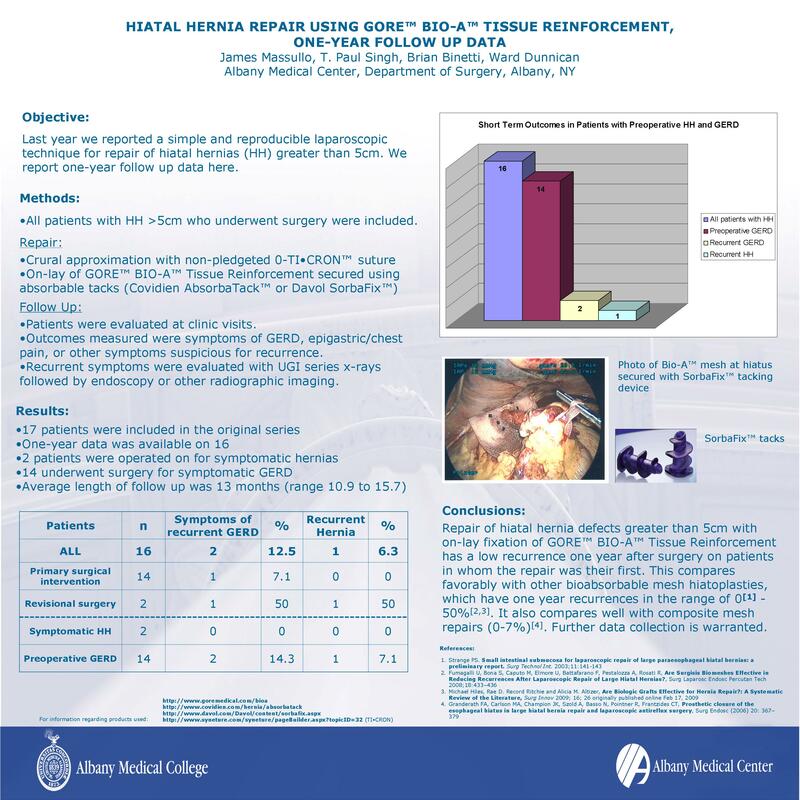 Conclusions: Repair of paraesophageal hiatal hernia defects with onlay fixation of GORE™ BIO-A™ Tissue Reinforcement has a low recurrence of symptoms one year after surgery. This approach has results comparable with other reported mesh repairs. There is a trend toward lower recurrence when this is the primary surgery performed. Further data collection is warranted.